You started playing the COC with an ordinary game. But you grow up with the game and now has a solid town hall 12. You are annoyed with your old name. Now you are looking for Change Clash of Clans Name? Then let me tell you. You are at the right place. I have been passed through this situation several times on other games too. But with Clash of Clans names. There has been always a difficulty to Change COC Name early in the game. But to make things simple and easy. 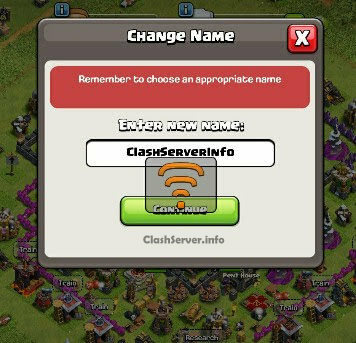 I am here with this easy step by step guide which will let you know how to change a name in Clash of Clans 2019 Updated version. Most of the time when you grow ranks in the game. There are Clans where you want to set with their theme. And with an ordinary name in the list, it’s most probably asking for a Kick out from the clan. Beside this Having Cool COC Name can also set inspiration for newbies. We are also looking to bring 1000+ Cool Clash of Clans names and Clan titles for you soon. So stay tuned to get the latest updates. Recently the COC has got the newly updated v11.446.10 is the current version. There have been lot of changes made in the Name Changing Rules of the game. Now you have got one chance of changing your name in the game. The second time you have to ask the SuperCell Support with some valid reason. Then they will decide to how to respond to your request. Their response could take a couple of days. Once they find your request valid. 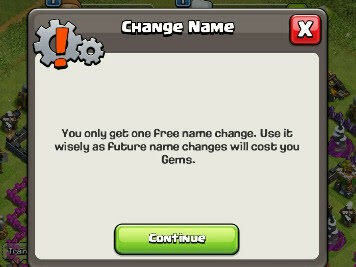 They will automatically set your new suggested name for your COC account. One thing you should keep in mind is that you can’t change your COC ID or COC name every know or then. So better find the coolest name first and make your mind to go with it. If you are changing your name for the first time then it’s quite simple and easy to do it. Open the Clash of Clans Game. Make sure you have the original COC game, Not any Modded version of Private Server. Tap on the Change Name option as seen in the image. A new screen pops up to ask you for your new name. Type it and tap on Continue. If confirmation option shows up, re-Confirm it. That’s it. 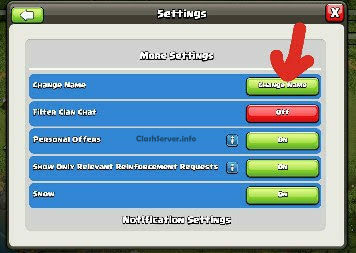 You will immediately see your name Changed in Clash of Clans main game. If you have already taken advantage of First Free and immediate name Changing opportunity, then you have to apply for a longer process. You have to write a Name Change Application. For that, You can simply access the Contact Us option in the game. Head to Settings > Help and Support > Tap on Search icon > then Scroll down to bottom and tap on Contact us. Here you will see the email option. Send the developers a Name Change Request. Once the Application is received, You will get an immediate email to confirm the receiving. But it’s just a Receiving confirmation. Now you have to wait for 24 to 48 Hours and you will be contacted again with a Positive or Negative response. Now, this is a bit tricky here. There are quite grim chances of changing the name for the third time. And if you somehow managed to change it the third time, it’s even tougher changing the COCC name 4th time. Applying for Name Change in COC for the third time is almost identical to the method used in the second time. Open Clash of Clans Game. Tap on Help and Support option. This section comes with tons of options. Just click on the top right Search icon. Scroll down till the last option. You will see Contact Us option there. Now simply tap on Contact US and send the SuperCell team a Valid reason to change the name for the Third time. In most cases, if you have a genuine reason. You can easily get a new name rewarded. However, keep this in mind that some time SuperCell responses are a bit harsh and you will be disappointed for Change Name Application Rejection as seen in the image below.